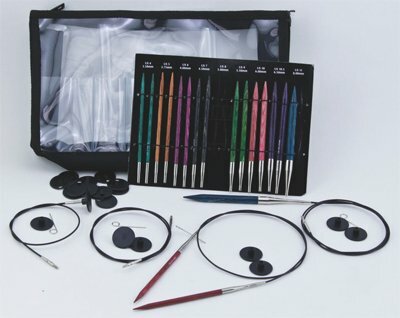 Knitter's Pride Dreamz Deluxe Interchangeable needle set is made of densified laminated birch from Vermont. These strong colorful needles have sharp points for ease of knitting with smooth joins that don't snag. Each needle size has its own color. Buy the set you get the whole rainbow! Includes a set of nine needles US sizes 4-11, 4 cords to make 24", 40" and 2- 32", 8 end caps, 4 cord keys, 1 vinyl cord case and zippered vinyl case.